For example, consider three different business: a freelance graphic artist, an eCommerce store selling men’s clothing, and a local bathroom renovation business. While they’ll all need many of the same basic elements, their different business models put the focus on different areas. The huge range of different web builders is another problem. There’s some great solutions, some real duds, and a whole load in-between. You don’t have time to try them all yourself, so we suggest you pick a couple and trial them. The freelance graphic artist’s primary objective is to display a beautiful showcase of their work that will inspire potential clients. Their website is their online business card, they want something stunning to which they can send clients. The eCommerce store’s primary objective is to have a front- and back-end that enables them to sell clothing effectively. A web builder with strong eCommerce options is vital to achieving this. Additionally, the eCommerce store will also need features that make it easy to add products and the potential to install powerful plugins to carry out essential tasks such as inventory-tracking. They’ll also need an easy-to-use cart and reporting functionality. 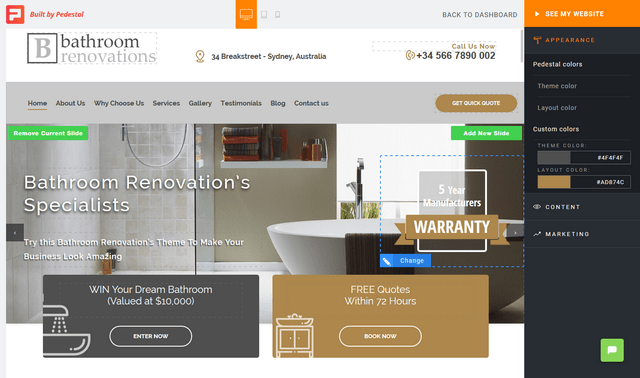 The local bathroom renovator business’s primary objective is to market their business to local clients. Options that boost local search engine marketing, help enable paid ads and increase conversion rate are essential. Establishing the industry you’re in, the way you’ll use your website, and therefore the features you need is an important first step because most DIY web builders excel in particular areas. There aren’t any web builders that are market-leading in every area, which means you need to prioritize. Once you know what you want to achieve with your website, it is time to think a bit more about what you need it to provide to reach these goals. Primarily, you need to think about which features you need, but other factors such as price, usability, and support should also factor. •Few website builders offer everything – Some features, such as eCommerce functionality or advanced marketing features, aren’t available to some web builders. In most cases, a jack-of-all-trades is a worse option than a builder that specializes in the areas that are important to you. •Marketing — Marketing is one of the most underrated elements in your choice of a website builder. If you want your website to generate the most amount of leads to grow your business, it is important to ensure your builder has inbuilt marketing strategies customized to your industry? •Buy for the features you will need in 18-24 months – If you rush to purchase a website builder without considering your business’s future needs, you might find you need to repeat this process in a year’s time. Save money later by purchasing for the future now. •Beware limitations – Many web builders, especially the cheaper ones, impose limitations on certain features. For example, you might only be allowed five pages. This is ok for personal websites, but businesses should expect to pay a bit more for unlimited service. The lack of functionality is not worth the few dollars you save each month. •Compatibility – If you are already marketing online, it is likely that you will be using some tools already. If not, you soon will be. The ability to connect your website with these tools can save valuable time when marketing. The features you look for will depend on what you want to achieve but don’t forget that your website is a marketing tool. Pretty images, videos, and widgets are great, but if your website builder cannot help you get your business in front of potential customers, it is not going to bring you a good return on investment. Easily create a homepage that displays the key information your prospective clients need (such as opening hours, address). Simple controls that make it easy to update images and text. Add a blog to your website (so you can create ongoing content, which is great for SEO). Responsive display that adjusts to different screen sizes, ensuring that your website is mobile friendly. Customers judge your business website on a number of factors, with the look and quality of the website being high on the list. This instinctive judgment contributes to how much they trust your business and whether they believe you are going to give them a good service, so it is important that your website looks as good as possible. •Pre-Set Themes – Website builders come with several preset themes that allow you to choose a premade look to use. Some website builders offer just a few themes, while others offer hundreds to choose from. The themes are also a good indication of what can be achieved using the builder; if you think a builder’s themes are all unattractive, it is probably not the right choice for you. •Customization Options – If you just stick with a pre-set theme, your website will not look great. That is where customization comes in. More customization choices help you get the website exactly right, but there’s a trade-off: more choices increase complexity and means you will need to use more time working on your website. Although cheaper than creating your own, a website builder does represent an ongoing cost for your business, and the cost is important. Many website builders appear incredibly cheap, with options that are free or just a few dollars per month. However, these options rarely have all the features you need, and once you start adding in the extras, even the cheapest web builder can start to add up. Although it is important to stick to your marketing budget, many businesses make the mistake of compromising features so they can save a few dollars per month. If you are a freelancer who just needs an online business card, this might be practical, but for businesses who rely on the internet for new customers (or want to in the future), a website should be seen as an investment. As with most purchases, you get what you pay for. Even if you start with a pre-set theme, you are still going to be spending some time getting your site right. A web-builder can have hundreds of great features and customization options, but if they are hidden beneath a user interface that makes them impossible to access they are of little use. •Get Online Faster – The faster you get your business online, the quicker you will start to build your web presence and pull in new clients. •Shallow Learning Curve – A shallow learning curve enables you to easily delegate simple website tasks to other employees; a business owner should not be the only person who understands a tool. •Respond Quicker to New Opportunities – So, you’ve realized there’s a new opportunity in your market? Great! Unless taking advantage of it requires hours or fiddling with your website builder – in which case, you probably won’t bother, and an opportunity will be missed. The level of support you receive from the team behind the website builder can make or break your experience. Unfortunately, you may not have a clear picture of the level of support provided until you have been using the web builder for some time, although reviews by other consumers may also help. Your best chance to test this is to send the support a few queries while you are still in your trial period. If their response time and level of help are unsatisfactory, you can still get out before it is too late. You should now have a good idea of what the requirements are for your business and what features you need to look for in a web builder. If you are still not sure what to pick we have recommended a few options below according to specific use cases, which might be a good place to start. Once you have chosen one or two that meet your requirements, it is important that you take advantage of any trial period you are providing with. Some builders provide full functionality for up to a month for free, while others allow you to access all their options but require you to pay before your website goes online. It is easy to start a free trial and then allow it to elapse without having tested out the web builder properly. Don’t do that. A trial is your opportunity to thoroughly test a web builder before you have to commit your cash. Create at least one page so you can test the features and usability of the web builder. Check that the web builder has the key features you need and that they work as you would expect. Check compatibility with any tools you currently use. Contact support with queries so you can test their level of response. Get opinions from other staff who may need to use the website. If you are a freelancer or in the creative industry, your most important asset is your portfolio, so it is important that you show it off well. 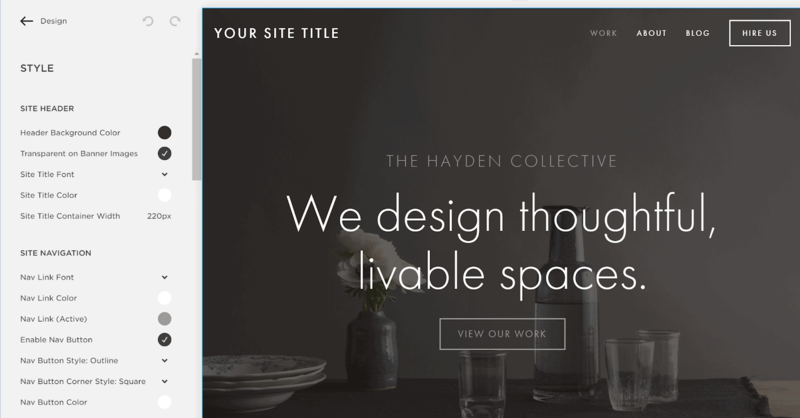 Squarespace offers high-quality pre-made templates that look great and are fully customizable and responsive. 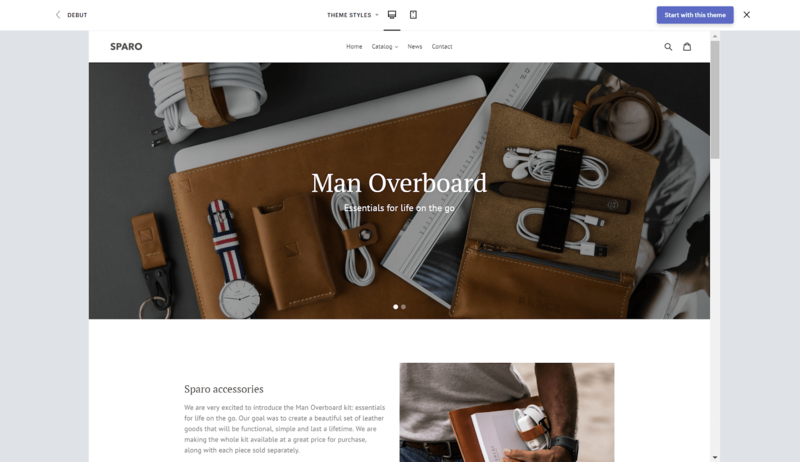 Squarespace has a slightly steeper learning curve than some other web builders, but the results can be outstanding.Other features of note include video backgrounds, image editing features, and excellent analytics tools. There’s also eCommerce support, which could be used to sell your services or products online. Shopify is often left out of website builder lists because it is built expressly for the purpose of creating an online store. Although its primary features are focused on creating and running your online store, the site can include static pages and a blog, just like any other website. The Shopify CMS makes it easy to add, edit, and track inventory. Shopify provides a variety of templates that can be modified using a drag-and-drop editor, so your website gets online quickly. The biggest benefits are under the hood: the Shopify CMS takes care of a lot of the details of running a store, so you don’t have to worry about them. Shopify provides a secure shopping cart and payment by most major credit cards and online payment processors, as well as an optional upgrade which allows you to sell in-store from a tablet. For most local businesses, the primary role of a website is to pull in potential customers. Pedestal is our pick for these businesses because, unlike other web builders, it has been built from the ground-up for marketing small businesses. Pedestal states that businesses that use its web builder generate, on average, 26.7% more leads than if they used another web builder. Pedestal achieves this increase by providing powerful marketing functionality built-in to the system and by pre-optimizing their starting themes for marketing. Pedestal offers a 14-day free trial for testing, and then plans start from $49 per month. Alternatively, businesses can pay $500 for a year, saving almost two months of fees. Picking your website builders is a very important step for your business. It’s the website that you and your team will be using for years to come. There are a vast array of options out there and going through them all will take you a lot of effort. We hope that this guide will help make your selection of a website builder that little bit easier.